Huawei’s first U.S. flagship takes aim at Samsung with a ton of screen packed into its svelte, slim body. If you hold the Huawei Mate 9 just right, it can almost look like a Galaxy Note7. Granted, you probably don’t want it to look like a Note7 after all it went through, but there’s no denying the character and craftsmanship that Samsung’s phablet exuded. And while there are distinct differences between the two handsets, the sturdy, svelte build of the Mate 9 instantly conjures images of the Note7 in happier times. But that’s not to write it off as a copycat. Even with a somewhat derivative design, the Mate 9, which recently became available for purchase in the U.S., packs quite a punch. With a proprietary chipset, Leica-branded camera, and decidedly unique spin on Nougat, the phone absolutely plays by its own rules, and proves that Huawei can hold its own against other premium phone makers. The Mate 9’s 5.9-inch display is flanked by small bezels that allow it to fit comfortably in your hand. Of course, small is relative here. If you’re not a fan of phablets the Mate 9 is unlikely to convince you otherwise, but large phone lovers will appreciate just how much screen Huawei has built into this phone. For comparison purposes, it’s just 2mm longer and 3mm wider than the Pixel XL (and just as thin), yet you’re getting nearly half an inch of extra screen. Display purists will grumble about the seemingly low-density 373ppi density, but the 1080p resolution doesn’t dull the Mate 9 experience in the slightest. While the sides of the Mate 9’s glass curve down kind of like the Galaxy S7 Edge or Note7, the display ends before the curve. However, I barely noticed the bezels, and the slight curves felt smooth and natural in my hand. Furthermore, its thinness helped make it seem far less unwieldy than it should, even when attempting to use it with one hand. With such skinny bezels, Huawei opted to put its name where the home button would be (a Samsung-inspired design feature I could do without), so you’ll find the fingerprint sensor around the back. It’s noticeably smaller than one on the Nexus and Pixel phones, but its speed mostly made up for my sloppy fumbling during most unlocking attempts. Equally offputting is the placement of the sensor, about an eighth of an inch below the camera and a good half-inch away from where my finger naturally rested, and I often had to readjust my grip to reach it. Hauwei placed the Mate 9’s power button below the volume rocker, and I had a devil of a time getting used to it. As someone who generally relies on vibrations rather than sounds, I found the Mate 9’s haptic engine to be alarmingly powerful. It jolted me out of my chair a couple times when a alert came in and eventually I shut them off altogether. 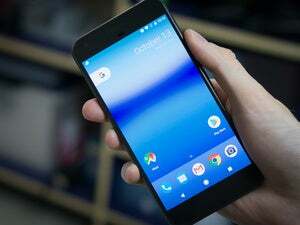 Even the keyboard vibrations were bit too strong for my liking (a feature I use on my Galaxy S7 and Pixel phones), and I found myself wanting for an intensity slider. Then there are the physical buttons. The volume rocker and power buttons are both on the right edge of the device, but unlike the Pixel, the power button is below the volume controls, and I lost track of how many times I pressed volume up expecting the screen to turn on or off. It’s a small issue for sure, but if your muscle memory as stubborn as mine, it’s one that will be a constant bother. Like the international Note7’s Exynos 8890, the Mate 9 is built on a proprietary processor, Huawei’s own HiSilicon Kirin 960, an octa-core Big.Little CPU design with four ARM 2.4GHz Cortex A73 cores coupled with four Cortex A53 cores clocked at 1.8GHz. What that boils down to is a downright screamer of a chip. From scrolling to scrubbing, everything on the Mate 9 feels buttery smooth, and it rarely got warm, even under heavy loads. Apps launched instantly, movies played with little-to-no lag, and live streams were impressively clear. Benchmarks were mostly on par with the Pixel, but in day-to-day use it felt even faster than the Snapdragon 821, a real feat for a device with such a large screen to keep lit. If it wasn’t for the 1080p screen, in fact, it would be a killer Daydream phone. As such, Google recommends the Mate 9 Pro, which has the same processor but adds a 2K curved screen. A large battery gives the Mate 9 fantastic longevity. Also impressive is the battery life. The Mate 9 includes a giant 4,000 mAh battery, but with such a gigantic sdisplay, I was dubious that I could last through the whole day. Those fears were completely unfounded, and not only did the Mate 9 tear through a heavy day like a champ, it rarely needed a charge at the end of it. And its SuperCharge tech let me quickly power up while I got ready for work in the morning, getting me from the red to a near-full charge in about an hour. In my benchmark tests, the Mate 9 topped off at a whopping 9 hours and 38 minutes, besting the Pixel XL by nearly three hours. However, since the Mate 9 started as a China phone, it doesn’t play nicely with the CDMA networks in the States. That means Sprint or Verizon subscribers like myself won’t be able to use it without switching to AT&T or T-Mobile, a real bummer and a likely deal-breaker for many would-be buyers. Like several of the flagship phones on the market, the Mate 9 utilizes a dual camera setup, with 20MP monochrome and 12MP RBG sensors that work together to bring depth of field and clarity to images. But the Mate 9 has one more thing going for it: Leica branding. The Mate 9 features a dual-camera system co-engineered with Leica. The name alone commands attention when you’re talking about photography, and it mostly lives up to the hype here. While it doesn’t offer the kind of leap the Leica name suggests, the Mate 9 is a definitely a solid performer along the lines of the Galaxy S7 and Pixel. Features like optical image stabilization and 2x faux-optical zoom give it a real premium feel, while easy-to-access manual controls give you tremendous control over every picture. The Mate 9 photo on the left doesn’t quite capture the same color and sharpness as the Pixel on the right but it’s still a solid performer. But even if you stick to the Mate 9’s auto settings, your pictures will be crisp and vivid. While I found some shots to be a touch undersaturated when compared to the Pixel, detail and focus were superb, even in low light conditions. Portrait mode (called wide aperture here) isn’t just limited to faces, and you can adjust the depth of field to fit the background, a neat touch that even the iPhone doesn’t allow. The phone’s f/2.2 aperture caused some softness with nighttime images, but coupled with the optical image stabilization and dual-tone LED flash, there weren’t too many unusable shots. When compared to the iPhone 7 (left), the Mate 9 gives you more control over how much depth of field your wide aperture photos will exhibit. Around the front, the Mate 9 sports an 8MP camera with several features selfie enthusiasts will appreciate. Autofocus helps the camera capture multiple faces quickly, and a beauty mode gets rid of any bothersome skin blemishes. And if you’re shooting in the dark, it will turn the screen white a moment before it snaps your picture to lighten up the shot a bit. Even if pitch-black rooms, the Mate 9’s faux-front flash will brighten your selfies. While neither camera brings anything particularly innovative to the table, that doesn’t stop the Mate 9 from being a top-notch shooter that will produce stunning images with little fuss. Huawei's Mate 9, the company's first U.S. flagship, looks to take on Samsung and Google with a thin, light handset that brings a huge screen and a ton of power. Small bezels put focus on the screen. EMUI 5.0 adds some character, charm to Nougat. Button/Fingerprint sensor placement creates some fumbling.